The fact is, buying a home today is absolutely, totally different from buying one ten year ago. Right there is why so many myths swirl around a process that, in many ways, is different from what it has been. What was true isn't anymore. Be ready to be shocked as we bust some myths below. Myth 1: You need a 20% down payment to even think about buying a home! Completely false. A down payment can be very low. There are conventional loans requiring just 3% for a down payment or even zero - the VA home loan program for veterans will cover 100% of the purchase price. FHA programs can be as low 3.5% and some USDA loan programs can be 0 down as well. Maybe five years ago, in the belly of the beast of the mortgage meltdown, 20% was in fact a necessity, but today most lenders are way more flexible. And if yours isn't, call me because you need to talk to someone else. Myth 2: Only those with golden credit need apply for home mortgages. Absolute rubbish. The past 6 years or so have been rough. High unemployment, a housing implosion, you know the realities. So do lenders, and an upshot is a heightened willingness to overlook past stumbles such as a foreclosure. Credit dings and blemishes, even a bankruptcy, short sale or foreclosure do not prevent you from getting a loan, even with a very low down payment such as 3.5% for an FHA loan. A new FHA initiative called 'Back to Work' explicitly cuts the time to qualify for a new mortgage after a foreclosure, bankruptcy or similar to as little as one year for borrowers who can prove their past financial difficulties were due to extenuating circumstances out of their control. 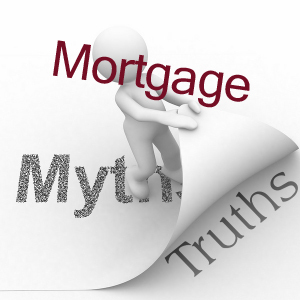 Myth 3: Fixed rate mortgages are the only way to go. Not always. The necessity of getting a 30-year fixed rate mortgage is one of the biggest myths about home buying. The average American household stays in their home for about seven years. Typically, 30-year fixed rate mortgages have higher interest rates than adjustable rate mortgages (ARMs). Homebuyers should take a hard look at their plans for the new home. Only 6.5% of applications for mortgages in a recent period were for ARMs, according to the Mortgage Bankers Association. A typical ARM went out at 3.21% interest, versus 4.69% for a typical 30 year fixed rate. That adds up to a difference worth tens of thousands of dollars over, say, a seven year probable life of the loan. Realistically look at how long you’ll be in your home before you make a mortgage decision and Do the Math! Myth 4: Cut out the realtor, represent yourself and you will save a fast 3%. That is just about never true. The realtor's commission, which in Texas there is no legal standard, is paid by the seller. Listing agents sign a contract with the seller for a certain commission percentage - for example, 6%. They offer to share a portion of that if a cooperating buyer's agent enters the picture - for example, 3% - but if there is no buyer's agent involved, the full 6% is still paid by the seller to the listing agent. The buyer has absolutely no say in this because it is agreed upon contractually by the seller and their agent. Could a tenacious and persuasive buyer negotiate, say, a 1% cut in the selling price by self representing? Maybe but saving the full 3%, I’ve never seen it happen. Myth 5: If you can, you should buy a home right now. All indications point that homes will be a strong investment over the next 10 to 20 years, mainly because in most markets prices have been savaged compared to 2005 through 2007 highs. What goes down goes up and the same will be true with housing. However there are plenty of reasons why renting is the better choice for many. It's flexible. There's little commitment. Take a new job in a different part of the country, and it's usually easy and low cost to move on. There also is no knowing how long recovery will take for housing where you live, and in some parts of the nation, experts predict it will be another 20 years before the 2006 highs are hit again. Just because you can afford to buy a home, doesn't mean you should. There are many factors that need to be considered before making that type of commitment. Do I have the time and financial wherewithal to maintain a home? How long do I plan to stay? Often, home buying makes sense. But owning one home, your home, is not necessarily a financial fast track to wealth. Know that, and the decision making process gets that much easier. However, if buying a home is in the cards for you then make sure you get the best deal you can. For a big deal call the Big Man in Texas real estate.